"Mr. Kolsby is a legendary Philly trial lawyer with innate trial skills which no one can replicate." A founding partner of Kolsby Gordon, Herbert F. Kolsby has been nationally recognized as a leading trial advocate since the firm’s inception in 1953. Mr. Kolsby is among a handful of practicing lawyers to have won the Philadelphia Trial Lawyers Association’s Michael A. Musmanno Award. He is a fellow of the American College of Trial Lawyers, the International Academy of Trial Lawyers, and the International Society of Barristers, and is a member of the Inner Circle of Advocates. He is listed in all recent editions of the Best Lawyers in America. A past chairman of the Commission on Judicial Selection and Retention of the Philadelphia Bar Association, Mr. Kolsby is a member of the bar of the Supreme Court of Pennsylvania and the American, Pennsylvania, and Philadelphia Bar Associations. He was also a member of the select committee of the President Judge on the Common Pleas Court of Philadelphia, and is judge pro tem of the Common Pleas Court of Philadelphia. Mr. Kolsby was a guiding force in establishing the Masters in Trial Advocacy Program at Temple University, where he served as the inaugural director and is now director emeritus. 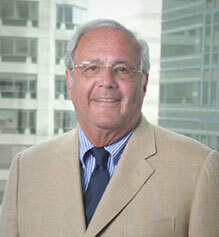 He has taught advanced trial advocacy in the J.D. program and served on the faculty of the Academy of Advocacy. Temple University recognizes Mr. Kolsby for his legal accomplishments and his contributions to Temple’s Masters in Trial Advocacy Program with a distinguished lectureship in his name. Mr. Kolsby earned his LL.B. in trial advocacy from Temple University in 1951.